Sentinel-1A SAR image of 18. 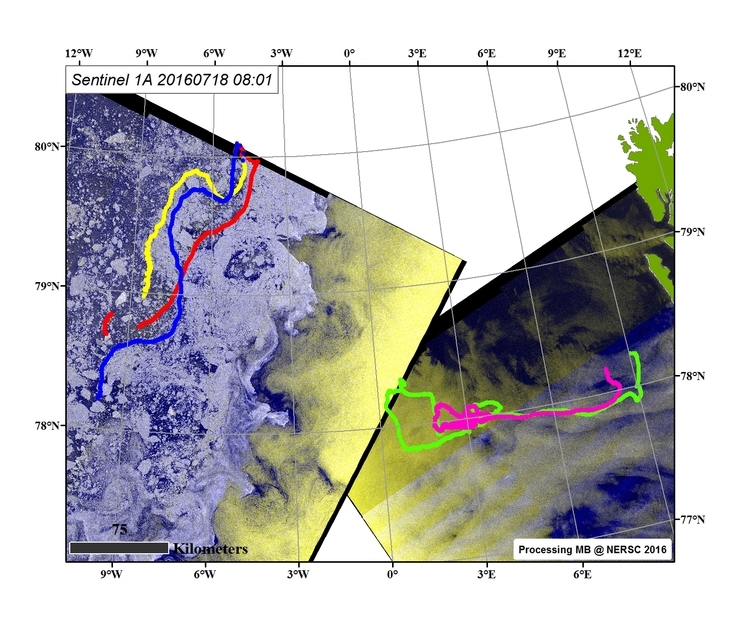 July @ 08:01, overlaid the trajectories of three GPS in sea ice and two sail buoys in Fram Strait. : Image processing: M. Babiker, NERSC. Sentinel-1A SAR image of 14. 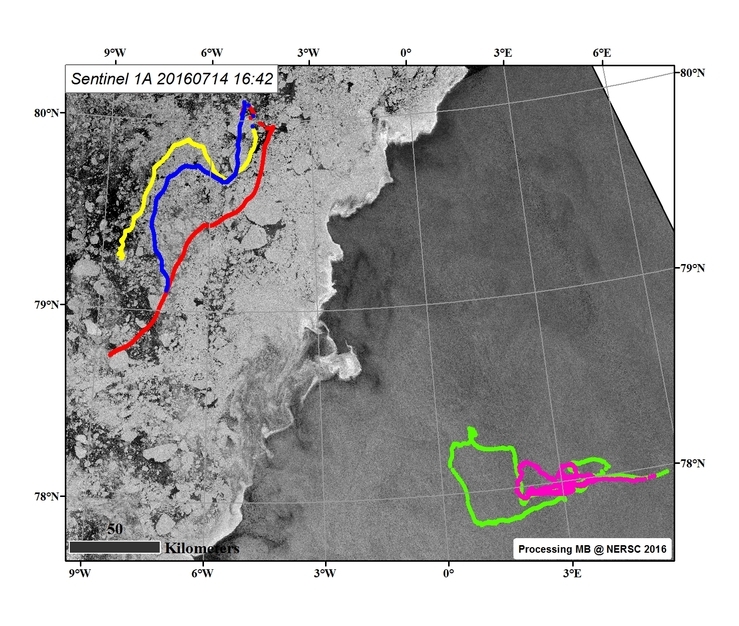 July @ 16:4, overlaid the trajectories of three GPS in sea ice and two sail buoys in Fram Strait. : Image processing: M. Babiker, NERSC. 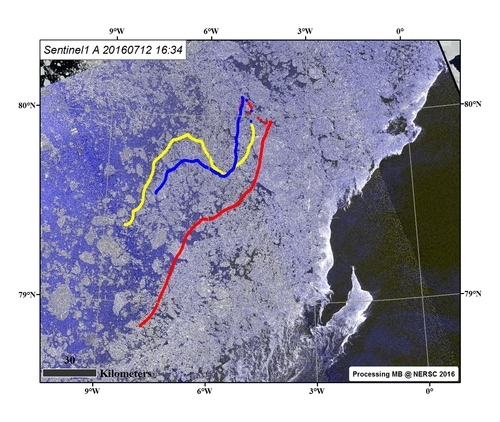 Sea ice drift from GPS tracker: Photo: S. Muckenhuber, NERSC. Sentinel-1A SAR image of 12. July, including the three GPS trajectories in sea ice in the Fram Strait. 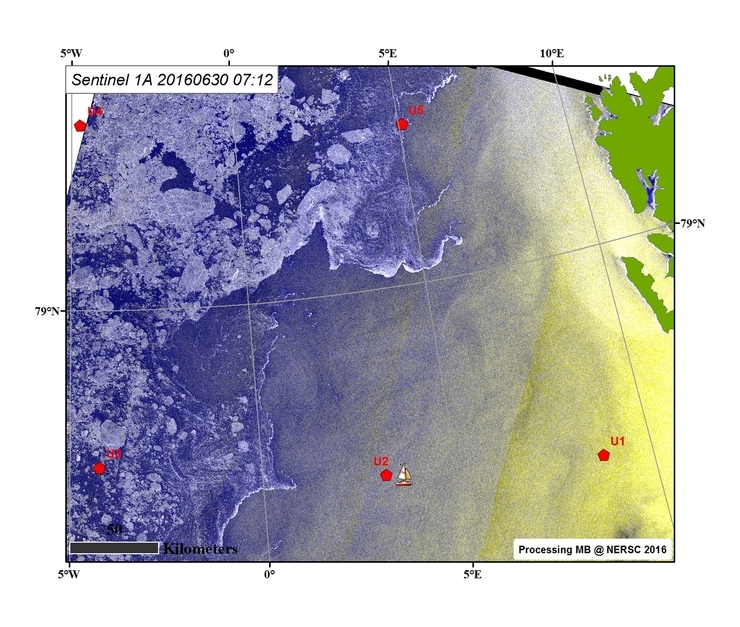 : Image processing: M. Babiker, NERSC.As part of the RCN project 'IceMotion', NERSC is developing a new high-resolution sea ice drift algorithm for satellite data from ESA's Sentinel-1 mission. 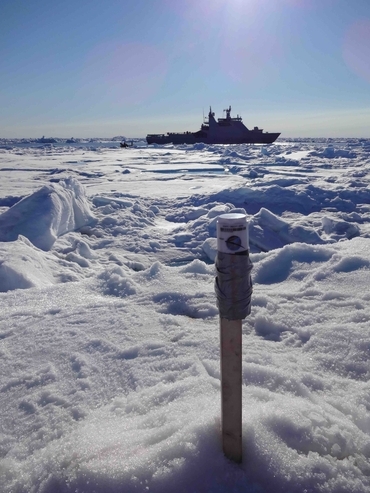 Sentinel-1A used to monitor the ice edge in the Fram Strait - 3. July 2016 @ 07:36: Image processing: M. Babiker, NERSC. 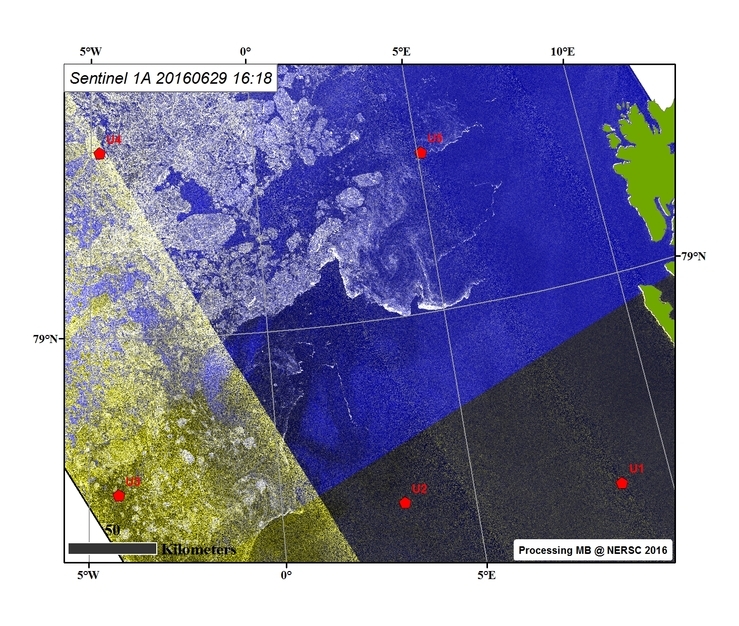 Sentinel 1A SAR Fram Strait. 30. June 07:12.: Sea ice in the Fram Strait is changing. Here is the sea ice distrubutions as of 30. June morning. KV Svalbard has deployed the Sail buoy near mooring U2 and its postion is shown, follow its voyage. Courtesy: Mohamed Babiker, NERSC. The recovery of the UNDER-ICE moorings is pending on favourable sea ice conditions in the Fram Strait. 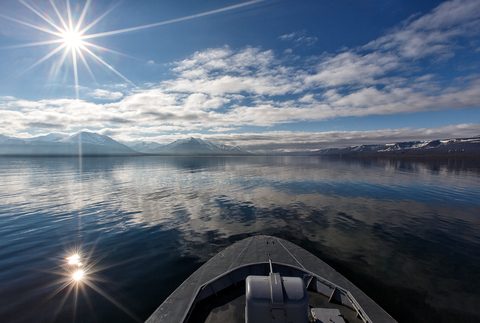 The Nansen Center is monitoring the sea ice conditions daily in order to support the KV Svalbard cruise during the next 3 weeks. 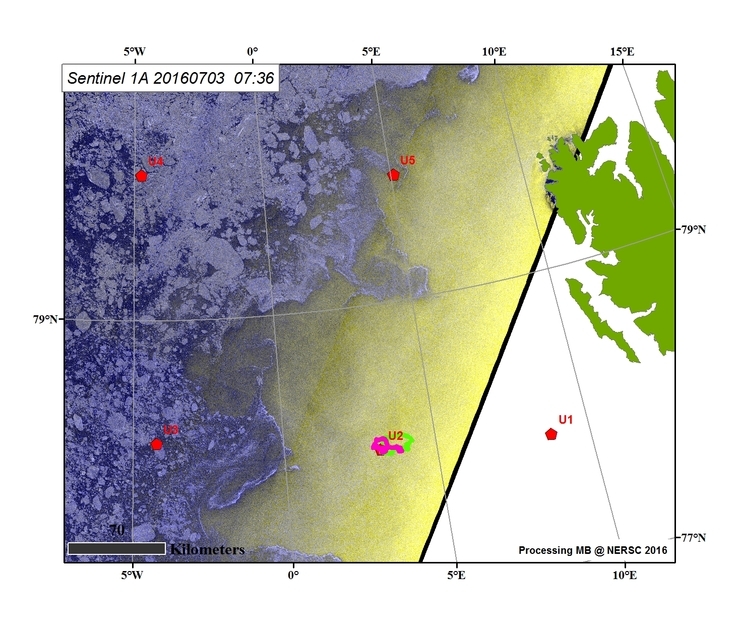 Sentinel-1A images as of 29 June including the UNDER-ICE mooring locations to be recovered.Here is the latest images from Sentinel-1A including the locations of the moorings to be recovered. Image processing and analysis: Mohamed Babiker, NERSC.